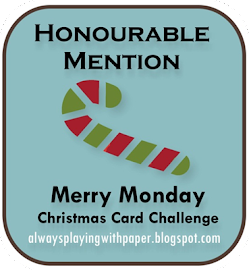 Tonight I'm sharing a little sneak peek of the December SOTM called Candlelight Garden. It's such a pretty and versatile set! I was holding this set for the SOTM blog hop on December 1, but in the bustle of last week's power outage adventure I plum forgot to sign up for the hop. I started with this week's challenge from Retrosketches. 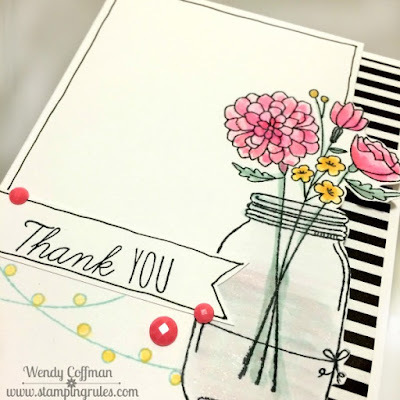 I stamped the jar and the bouquet along the right side of the card, then I fussy cut about 3/4 of an inch of the card edge right off. 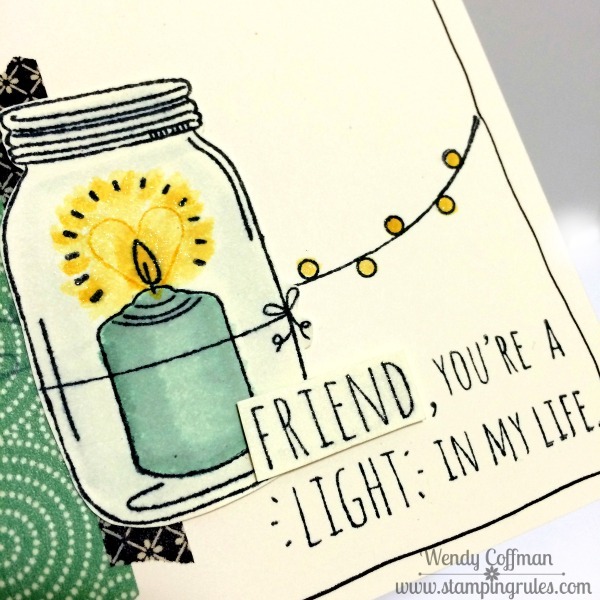 I masked off the jar and added the string lights using Glacier ink. Then I water colored everything using my water brush and ink from my pads (Glacier, Juniper, Honey, and Pomegranate). I stamped my sentiment onto a 3/4" cardstock scrap, then cut in a dovetail for a banner. 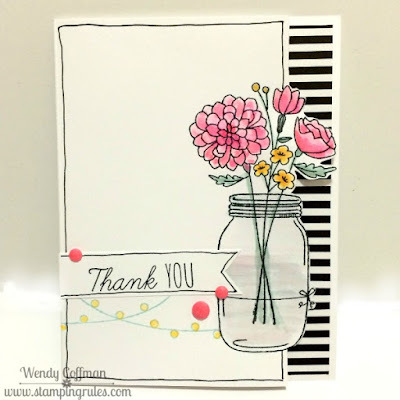 I outlined the sentiment and card front with a journaling pen. Finally I lined the inner edge of the card with some La Vie En Rose paper. I know I'm going to be loving on this set all through the month of December. 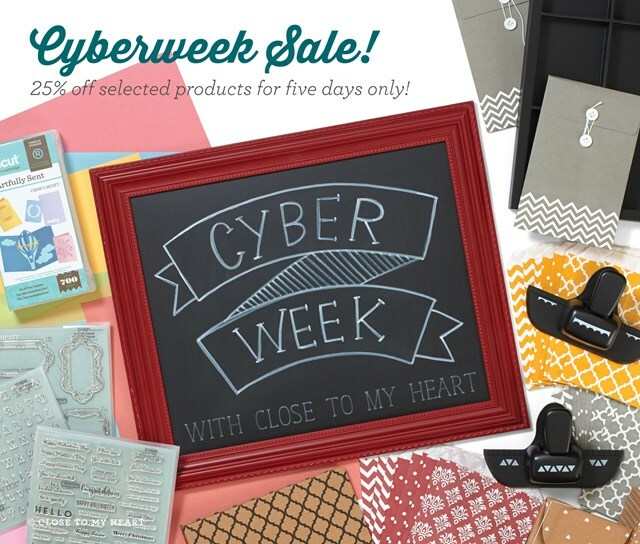 Don't forget to check out CTMH's Cyberweek Sale! From 8 a.m. PST on Monday, November 30 through 3 p.m. PST on Friday December, 4th, a selection of current awesome goodies can be yours at 25% off retail pricing. Get supplies you'll need to make handcrafted gifts and cards for the holidays, including the amazing Cricut Artfully Sent Collection at a fab discount! 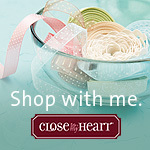 Let me know if I can help you make a plan to use these specially priced items to give your holiday gift giving a handmade from the heart touch! 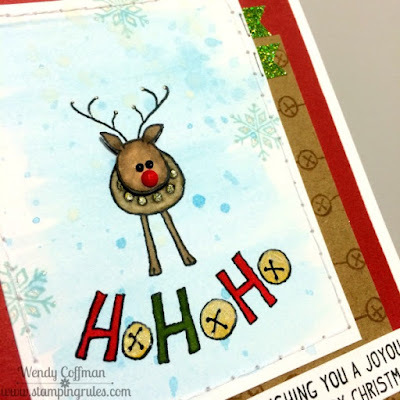 Tonight I'm sharing another sweet Reindeer Bells holiday card. I just want to put this cute reindeer on everything! I started off with this week's CAS(E) This Sketch challenge. 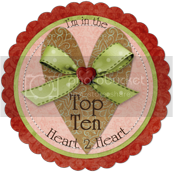 My sentiment was kind of small, so I popped it up on a banner backed with aqua shimmer trim to give it a bit more presence. 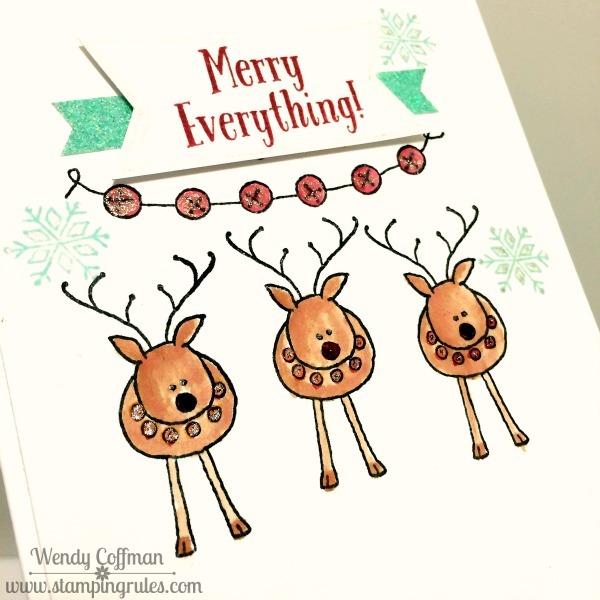 I colored the reindeer and bells with my waterbrush, using ink from the lids of my stamp pad as my paint. Then I added some shimmer gel pen accents, and gave the middle reindeer a dab of red stickles for a sparkly nose. Today was a busy Thanksgiving prep day. I made a dozen each of tiny pumpkin cheese cakes and pumpkin pies, plus a couple dozen banana pumpkin grain free muffins. We finished the ridiculously messy tissue paper snowflake cutting activity, bought new sleds, and froze our toes off in the ice/snow. 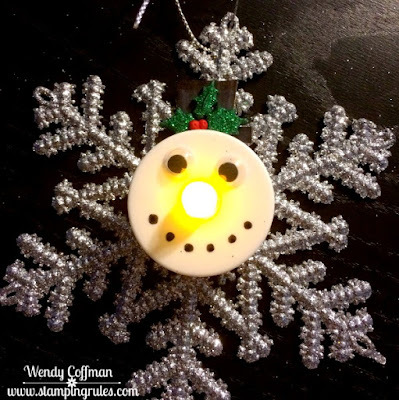 Stamping wasn't on the agenda, but the boys and I did make these adorable snowflake ornaments for our tree, using some of the battery operated tea lights from our Spokane windstorm power outage experience. The boys added googly eyes and sharpie mouths to the tea lights. We cut some hat shapes from an old shipping box and they colored them black. Then Mom (that's me) used E6000 to glue the lights onto some inexpensive glitter stars we scored at Target. so no one would be burned by the hot glue gun, with lots of advice from the peanut gallery. 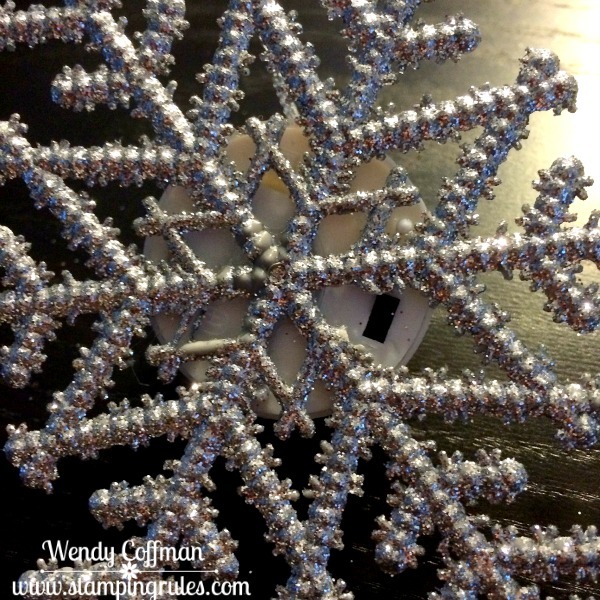 We added some resin glitter holly bits from my stash - I think I got them at Michaels. Every boy was pleased as punch. So tomorrow as I roast that turkey I've got dry-brining in the fridge that actually keeps things cold, I'll be grateful for my safe and healthy family gathered around me, for having enough food to feed us all, and for every little thing that I'm lucky enough to experience. So yesterday I was telling y'all how I was so happy to have our power back. I went out and re-grocery shopped and bought a turkey for Thanksgiving...and this morning, good bye power. It had snowed last night, and someone slid off the road and took out the power for our neighborhood. Luckily everyone was ok, but I was positive that we were once again powerless along with 18,000 other households. I spent the morning stocking up on easy to cook gluten free foods and googling how to cook a turkey on the stove top instead of in the oven. 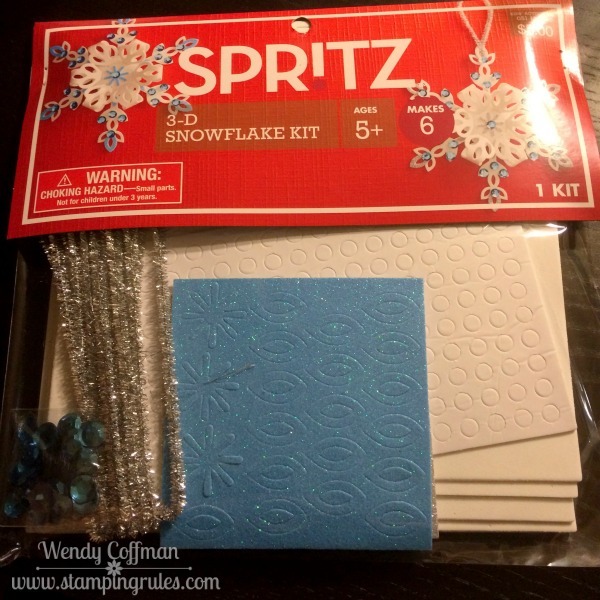 I also grabbed this Snowflake kit (and some other craft items) to help with another round of no power with three energetic boys. It looked a bit complicated, but I figured that might help keep Gabe's interest while I helped Ben and Max. The boys didn't need my help at all. 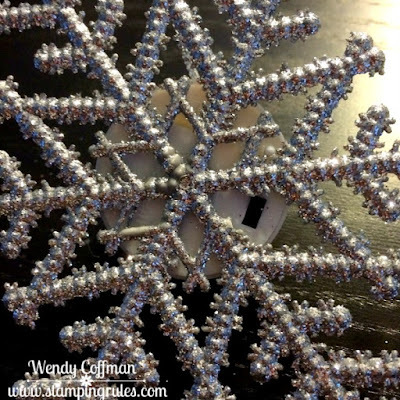 It was such a fun little craft kit, and everyone easily and happily completed a snowflake while singing a few holiday songs plus their current favorite Snape, Snape, Severus Snape. 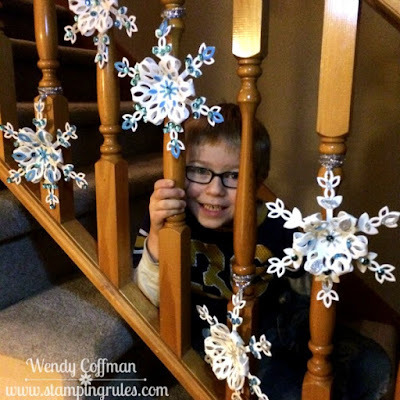 Max kept adding more and more of the pretty "Sequence" to his snowflake (we've been playing a LOT of board games). 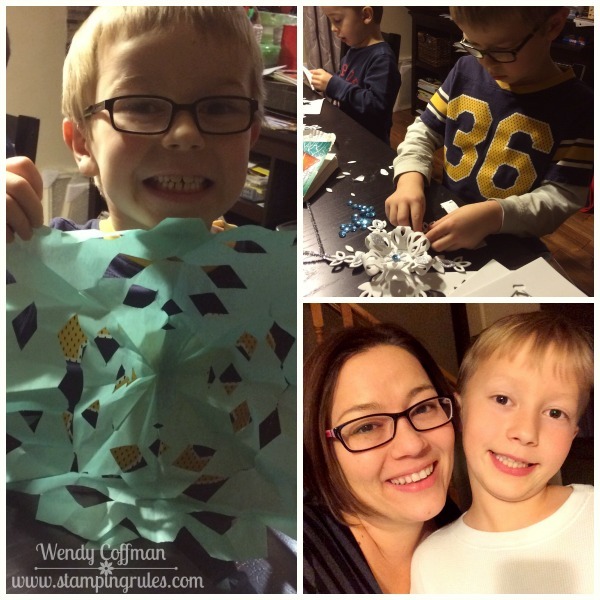 Once we had completed the crafting kit, we cut out a few more tissue paper snowflakes. My dining room floor is covered with bits of tissue paper, but it was the calmest evening we've had since last Tuesday. Thankfully, the power came back on about five hours after it went out this time. I'm not sure why, since there are still so many without, but I'm very grateful that we aren't camping in the living room again. I'm also glad that instead of working on a new stamping project today that we did these snowflakes. Ben usually hates crafting, but he is digging our snowflake project. He told me he loves crafting with me, which I never thought he'd ever say, since he basically does anything to get out of drawing, coloring, and painting. Then he asked if I wanted him to scrapbook with me, so I see an Instalife book coming soon in his future! 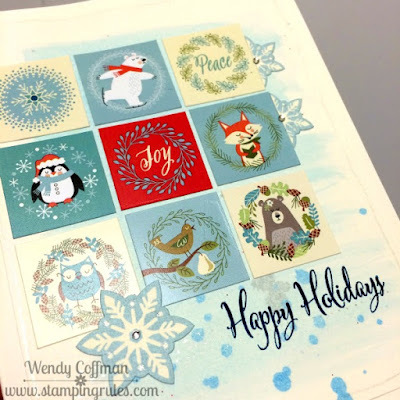 Tonight I'm sharing this quick holiday card, which is the first project I've crafted in over a week. I've missed my inky paws! I decided to try out the new sketch from Retrosketches. I painted a swatch of blue watercolor onto a Colonial White cardstock panel, then splattered it with a darker blue and some grey watercolor paint. Then I layered on some images from the Base and Bling Jolly Holiday Style sheet. 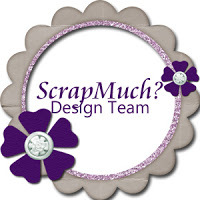 They are meant to be for the make your own jewelry stuff, but I thought the stickers were just so cute for a card too. 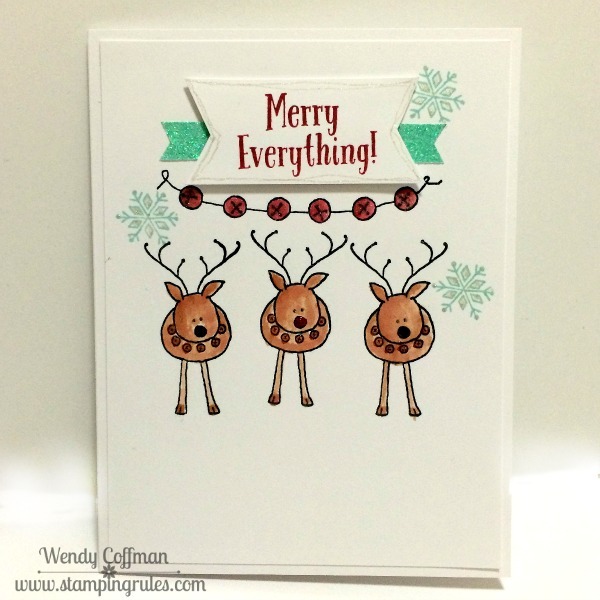 I added some White Pines snowflake stickers and a sentiment stamped from one of the Artfully Set stamp sets. This last week has been an interesting one for my little family here in Spokane. Last Tuesday we lost power in a huge windstorm. I had meant to spread out sharing my Album Retreat pages a bit more with other projects, but each night that we had no power and no Internet meant no crafting for me. We were camping in our living room to stay close to the gas fireplace with three little LED lanterns. We were lucky enough to get power back after 39 hours, but it took an extra day for the Internet to come back. There are still 23,000 homes in my town with no power, limited or no heat, and it's supposed to snow tonight. Also, my kiddos, my sweet, adorable boys...they really needed my full attention these last few days. Even with the power back, we will now have no school again until next Monday so at my house we are making a ton of paper snowflakes, playing lots of Tenzi, and trying to get these boys back to some semblance of normal routine. Short story long, there hasn't been a lot of time for crafting this week, so getting back to my craft table tonight was a real treat, and I'm feeling really blessed to have our modern conveniences back. It's been amazing to watch how the community has been working together to help those still struggling with no power or heat in this city wide crisis. 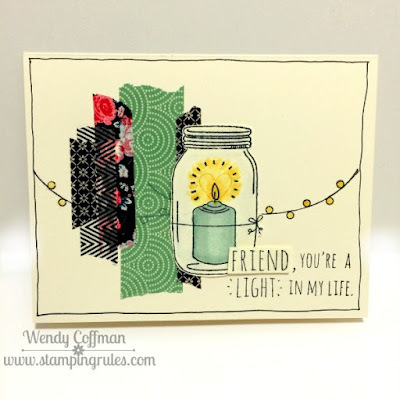 I hope all of you are safe and warm, too, Stampin' Friends! 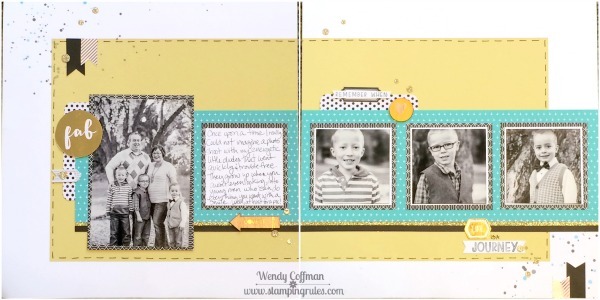 This layout is also one of my favorites from the Album Retreat. I love the bold Lagoon against the soft Canary with the strong black accents. This was my favorite watercolor splatter too. I used the blue at first, then added a bit of black. I also added actual black hand stitching around the background. 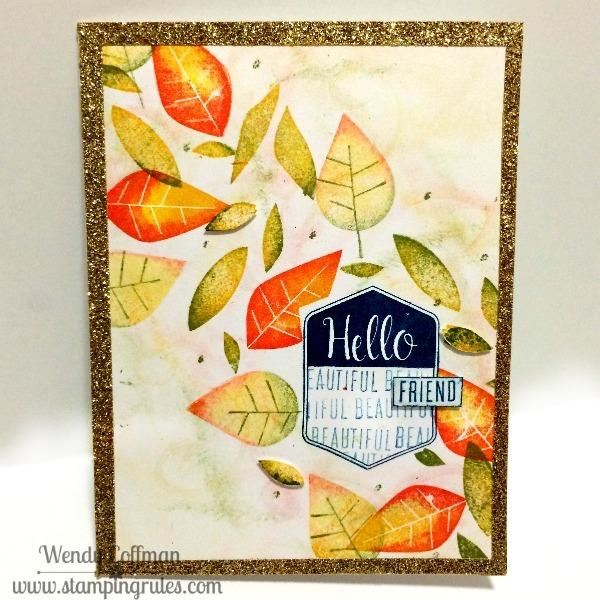 This is my last layout to share from the CTMH Album Retreat. I had such a good time, not just making these lovely projects, but hanging out with my CTMH peeps and enjoying some much needed girl time. I give this Album Retreat a five (right, Amanda?) 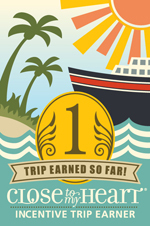 and I can't wait until I can be lucky enough to attend another! 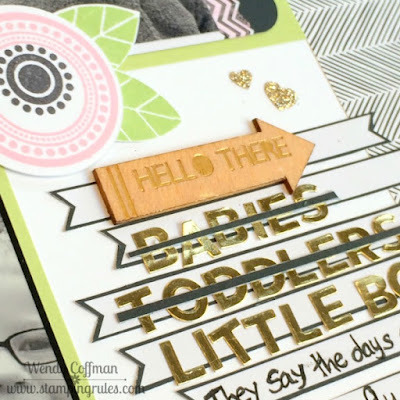 I love all the shiny gold touches on this layout. 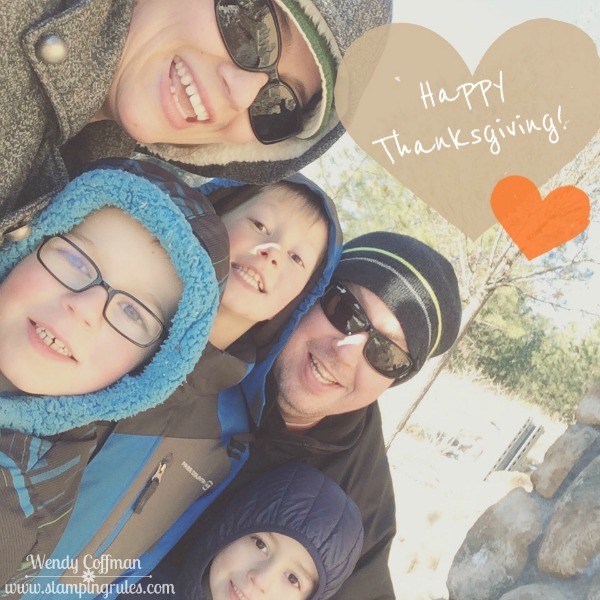 This was presented to be a layout about where I see myself in the future, but instead I used it to ponder on the funny way time passes so slow and yet so very fast when raising children. That picture of John with all the littles at once is one of my absolute favorites. 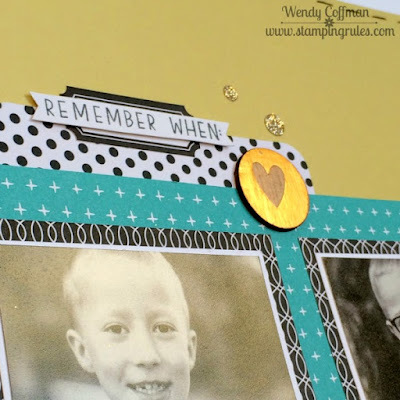 This is the layout where I used up all my gold letters (that were supposed to be for some of the other layouts). 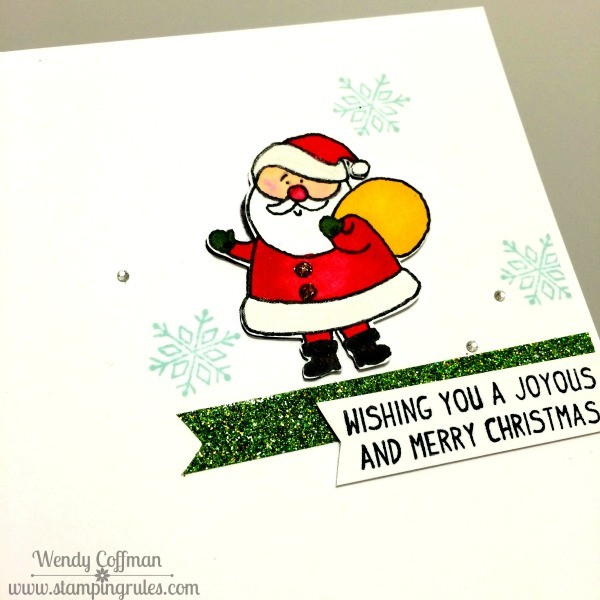 I just love the fabulous mix of textures in the Fundamentals assortments. How cute is this foil embossed wood arrow? This OH SNAP piece we trimmed out of a PML card. It's printed in gold foil - swoon! The flowers we stamped using So Many Smiles, which is just what making this layout brought to me. Today I'm sharing my second layout for the Scrap Much? Design team. This week's sketch is so adorable, much like the faces Max is making in my layout! 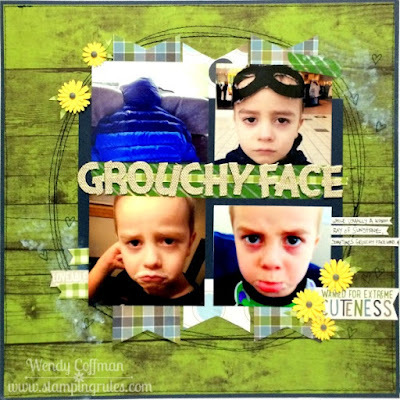 I think my favorite one is where he got his head stuck in the back seat of the car because he was so grouchy at me! 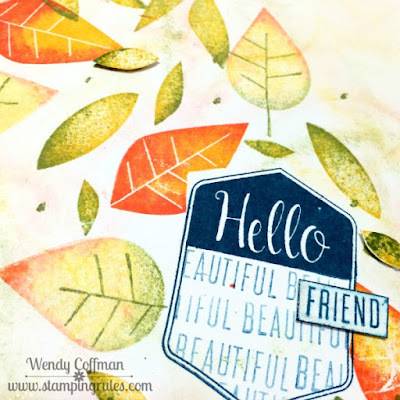 I started out with some Simple Stories wood grain paper - I love, love, love all the colors in the multi pack I got, with one side colored woodgrain and the other in gingham! I wanted that big circle to be subtle, so I stitched it freehand with my sewing machine a bunch of times. Then I daubed on some white ink and added some sketch heart stamps from one of my favorite stamp sets. 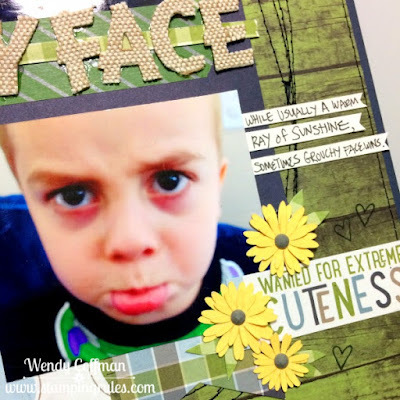 I added my layers in using the Echo Park My Little Boy papers. I made the flowers by layering three to four simple Cricut flower shapes and topping them off with grey enamel gems. I trimmed the cuteness sentiment out of an Echo Park journaling card. I also pulled in some of the Simple Stories gingham in the handcut leaves, banners, and under my Little Yellow Bicycle Burlap title letters. When I was making this layout I accidentally printed our that picture of Max on a full letter sized sheet of paper. I didn't want to use it like that, but I couldn't toss it...so we've been pinning it up all over the house and telling the boys, "Max does not approve!" in silly voices all week, cracking ourselves up. 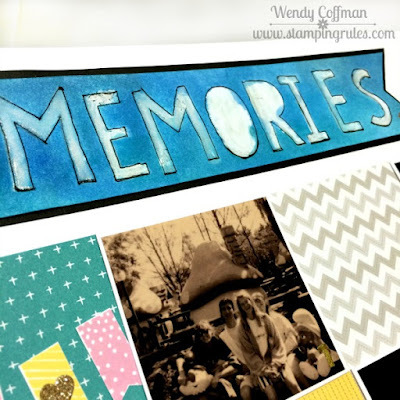 Here's the awesome sketch - I hope you'll be inspired to share a page over at the Scrap Much? 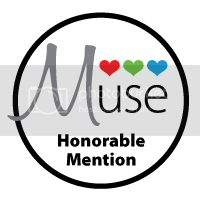 blog too! 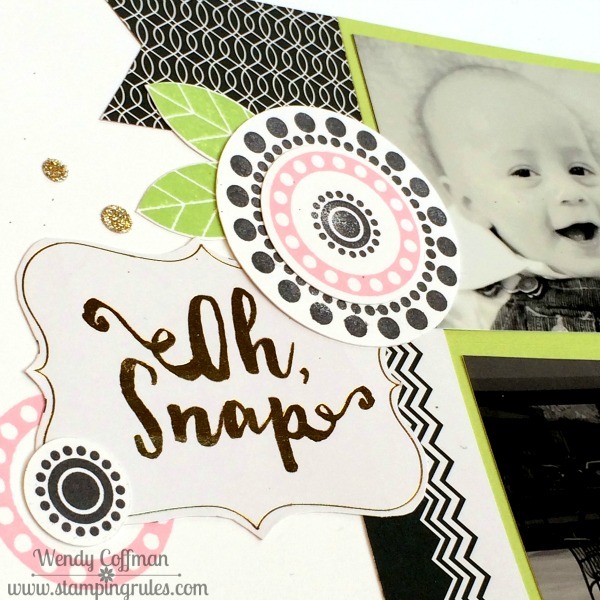 For this layout CTMH broke out a technique I haven't thought about in a long time. 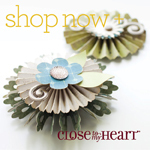 The papers are a mix of Charlotte, La Vie En Rose, and Lagoon Fundamentals. I love that bold black mixed with the softer Charlotte prints. For the title area CTMH had us crumple up a bit of packaging plastic (I used the wrapper from my fundamentals glitter stickers) and dab on Canary in from the pad using the plastic. This works really well with other found materials like bubble wrap, too. The title on this layout was so interesting to make. Every person around me did it a bit differently, so there were a lot of variations. 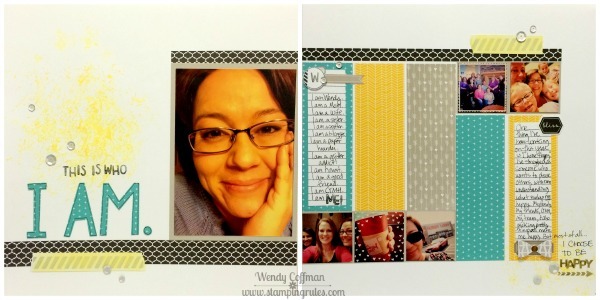 The layout is 3x3 squares of Georgie, Lagoon Fundamentals, and Charlotte papers. The title is watercolored - we were given the individual letters cut out of White cardstock and a strip of watercolor paper to make them. 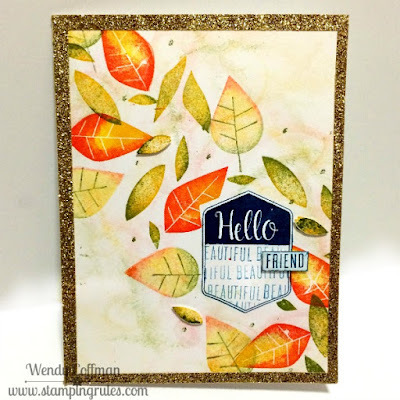 Some ladies painted the watercolor paper then adhered the letters over top of the dried panel for a really crisp look. Some used the letters as a mask, working one letter at a time to ensure a clean line. 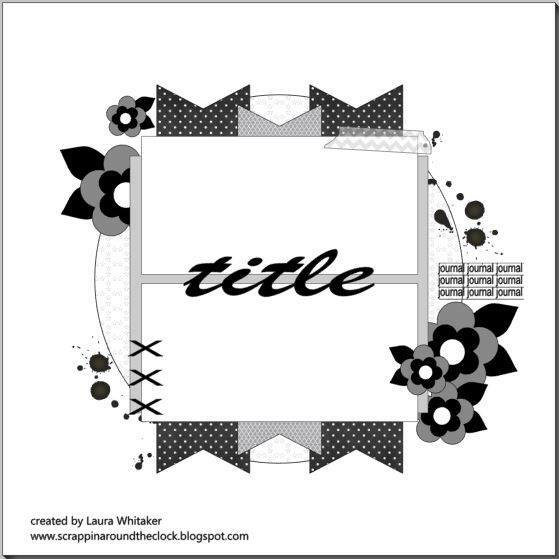 I chose to adhere all the letters onto my title bar and watercolor to my heart's content. That means I had a lot of bleeding in some areas, and not so much in others. 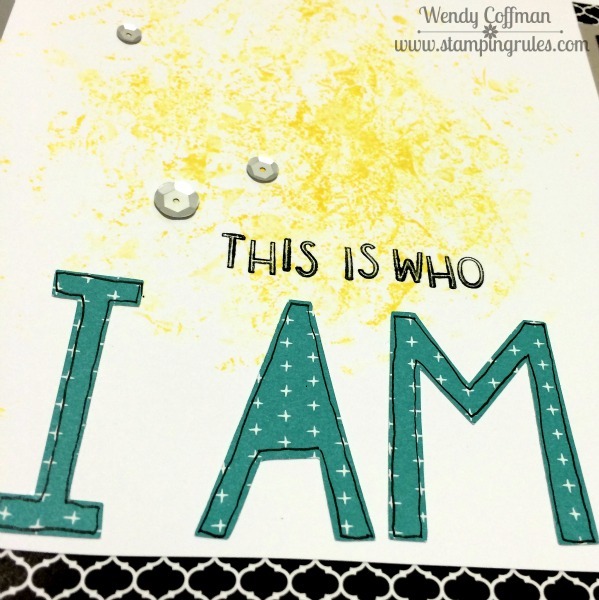 Then I outlines the title letters with a black journaling marker to redefine where my letters originally were. I also added a wash of clear Wink of Stella to the letters for a subtle shimmer. 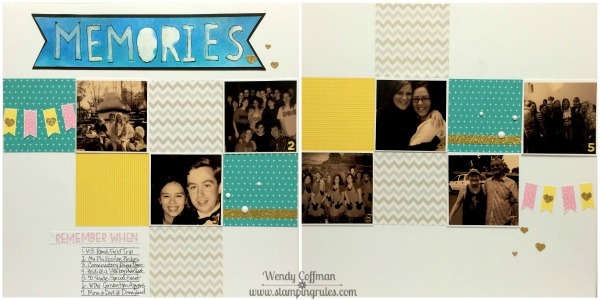 This layout is one of the prettiest techniques we tried at Album Retreat. 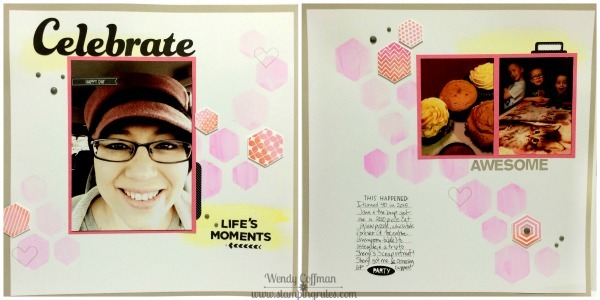 CTMH handed out hexagon templates cut into 12 x 12 pages of cardstock that we watercolored through. 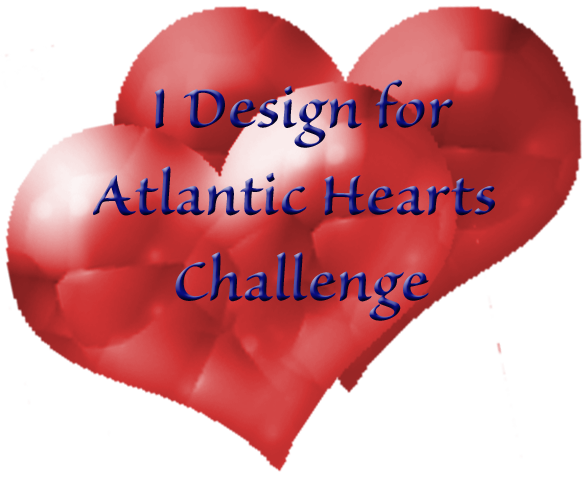 We also added some patches of pale yellow watercolor to highlight the title area. Isn't that just gorgeous? So much fun to work through the template with the brush! 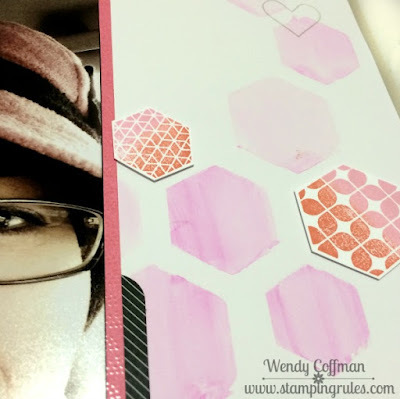 I also did a lot of rolling on my hexagon stamped images before fussy cutting them. The hardest part was waiting for the background to dry before adding the pics!